The last of the August Steepster Sampler! It’s okay, I will totally catch up now. In all fairness they skipped right over September and into October so I’m only one sampler behind, and actually it’s still October so all’s good! Dry: Lots of flowers. A bit of tea. And more flowers. And then some flowers too. Very floral. Not unpleasant in general. I like jasmine perfume, but it seems like it could be a bit much for tea. I don’t like drinking perfume. Aroma: Less flowery. Really pleasant and almost relaxing. Flavor: Delicious and oh so smooth. Good clean white tea flavor. Subtle jasmine flavoring. Really liking this one. Very soothing actually. Not too much to say about it other than “Mmm mmm good.” Simple. Sweet. Tasty. This has been working into my tea drinking as an evening tea. White teas have less of a caffeine punch (though I should probably check on that some day) and it has a nice, light flavor for the evening. Jasmine, to me, always reminds me of summer – particularly summer evenings where a gentle breeze carries the sweet, delicate fragrance from the potted jasmines on the patio. This tea evokes that perfectly, which is very cool since it’s very much fall right now… Excellent evening tea. 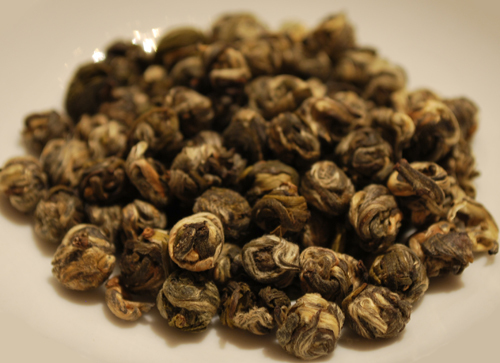 Tea Score: 92 – Very awesome jasmine scented white. The jasmine isn’t overwhelming and it doesn’t taste like soap or perfume. Cupboard Score: 80 – Great for the early evening with a slightly lower caffeine content. Could see missing this when my sampler packs are gone and possibly having to order more.